There are various methods to capturing an object to create a 3D model but the most common are Laser Scanning (costly equipment but more accurate) or Digital photogrammetry (less accurate but only needs digital camera). 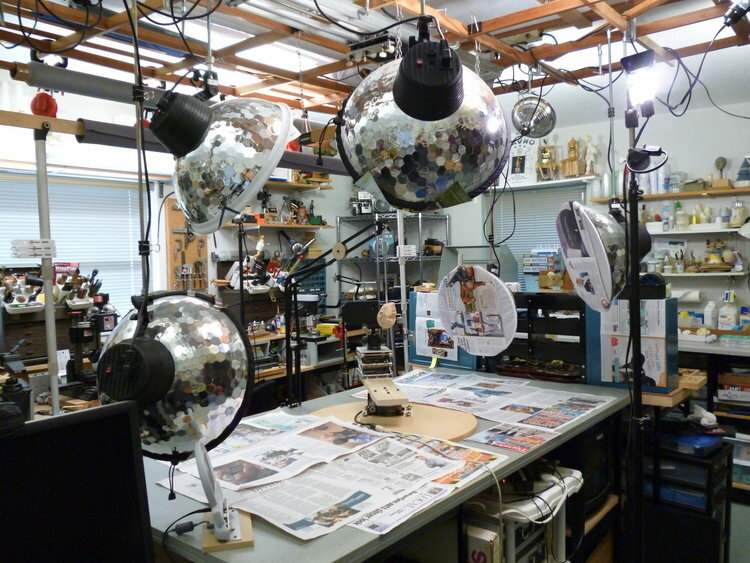 Laser scanning projects a light as the object rotates on a turntable, while Digital photogrammetry uses a digital camera that moves around the stationary object. 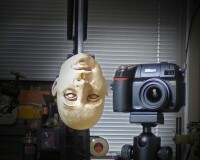 This is the method we used to capture our sculpted Head. Even though the Digital method is not as precise as the Laser scan, you can get very good results if the 3D scanning scene is setup properly. 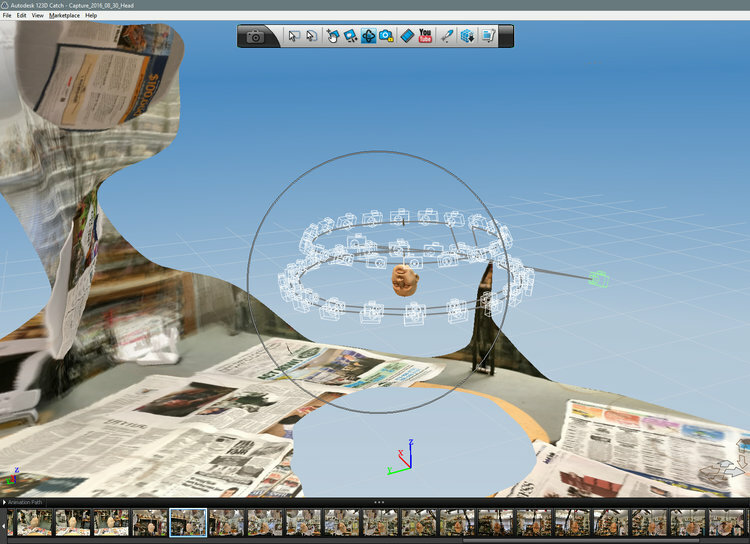 Photogrammetry takes measurements from multiple photographs, then uses the XYZ coordinates of the points to generate 3D digital models. 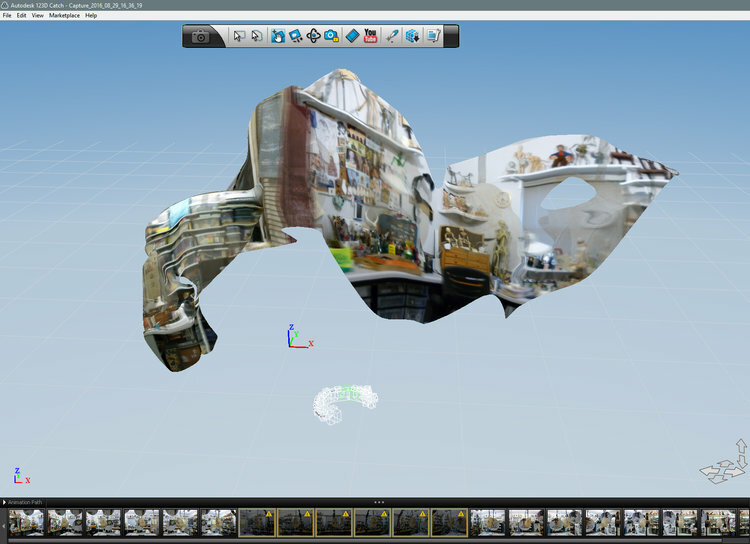 More points of reference provides accurate digital information, resulting in less time to clean up the 3D model to prepare for fabrication. 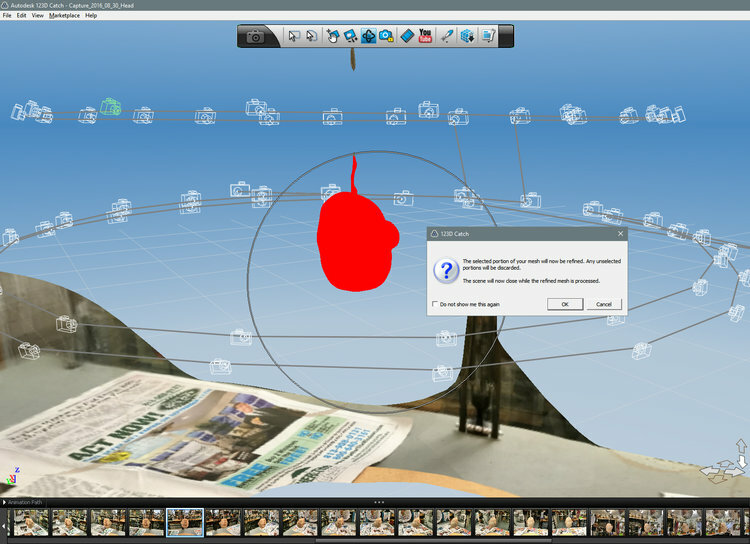 Photogrammetry does not play well with large blank surfaces like tables and walls. It needs non-moving points of reference in order to stitch together the 60 image captures (think of sewing a garment, seams have to line up). For the first test we kept the studio decor was ‘as is’ to see the if the capture of the Head could be successful with minimal effort. 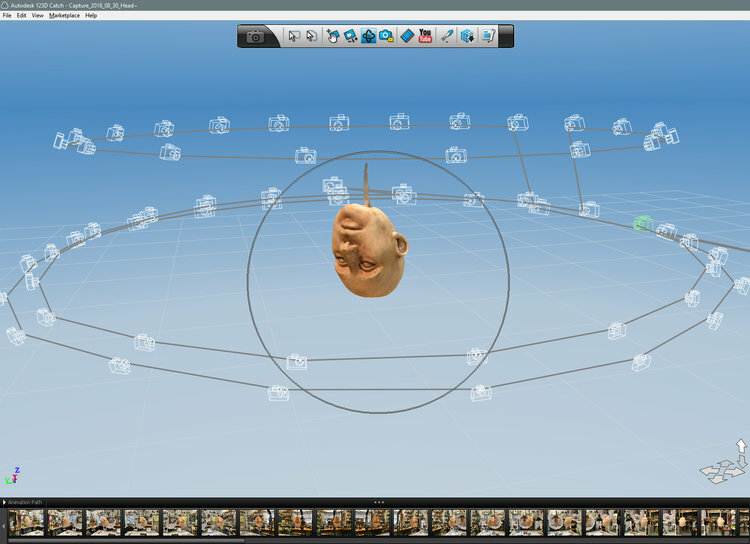 Uploaded the images to 123D Catch to stitch together to create the 3D model. Nope, sorry kids, not enough info to create the 3D model, you need to decorate the space. Not a pretty (or successful) picture. Head is no where to be seen, the yellow triangles in the thumbnails above mean digital info missing. The white ‘C’ in the middle area indicates only half of the camera images were processed. We can either repeat the process, or match points on the images to manually stitch them together. Boo – no fun! Large, blank surfaces were covered with newspaper and magazine pages. It is important not to have glossy, reflecting or repeating patterns, and no movement or changes to the scene. Additional tests with the new backgrounds were promising but getting the camera to cooperate was another challenge. We tried high-end, middle and pocket cameras, each had their own special quirks, again resulting in partial captures of the Head object. Ta-Dah! Pretty, pretty! A successful capture, not one dreaded yellow triangle! The white shapes around the head indicate the 60 camera positions — 20 each, top, middle, bottom — in a perfect circle (except for the green stray camera that we will pretend is not there). 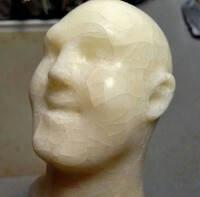 Upon closer inspection can see the top area of the Head is incomplete. This is mainly because our Capture setup was not able to position the camera low enough to shoot under the Head. 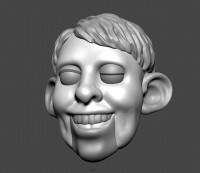 The missing area is not very detailed so will be easy enough to fix in Meshmixer, a 3D modeling program. 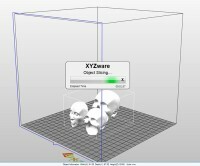 We will revise the Capture setup for the next 3D scanning project. It’s mesh-making time! Now the fun begins! 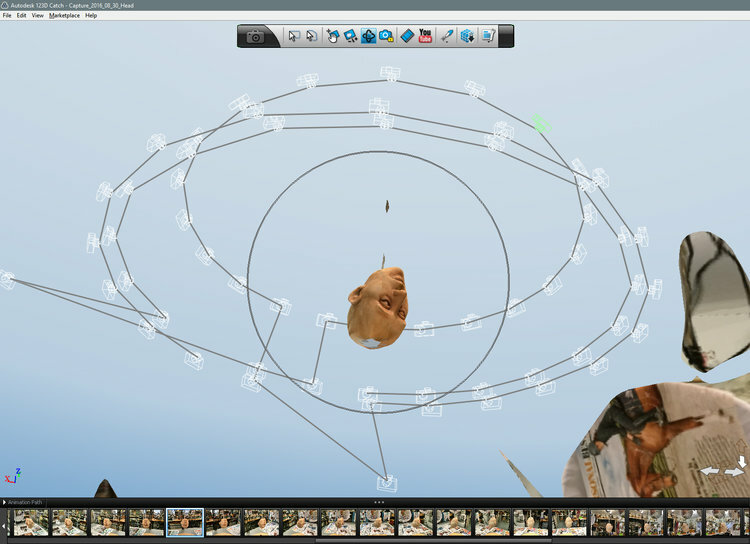 The Head is selected and the extraneous background images will be removed and a polygon mesh applied to the Head. Zoom in to show the mesh — Polygons o’Plenty! 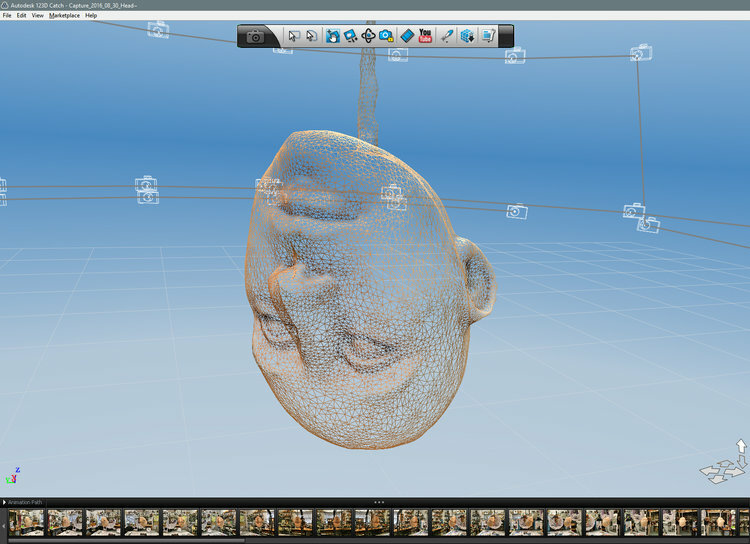 This is what 3D models are made of. Mesh processing complete. Background images have been removed, leaving just the Head floating inside a camera cloud. 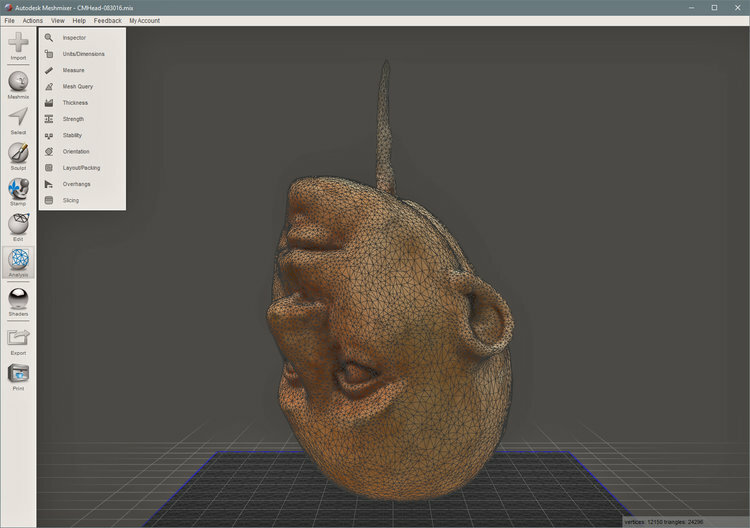 Next step is to bring the 3D model object into Meshmixer to repair and refine the Head, then prepare the model for 3D printing… this is going to take a while….